Terrell T. Garren. The Secret of War. Spartanburg, SC: The Reprint Co., 2004. With the 150th anniversary of the Civil War upon us, many libraries, including this one, have digitized diaries, letters, and other documents that bring the realities of the war–for both soldiers and civilians–to light in a way that our school textbooks did not. We now can know more about what drew men to fight for one side or the other, how they experienced the routines of military life, and how they felt about what they saw and did in battle. Life on the home front also can come alive in these documents, showing us that the war changed the lives of people who never left their communities. Terrell Garren covers this subject matter using fiction–fiction based on the experiences of his great grandparents. Joseph Youngblood’s military service took him from Henderson County to battlefields across the South and as far as a Union hospital in Indianapolis. Delia Russell stayed on her family’s farm, but the war came to her in a devastating way. Joseph and Delia’s stories are at the heart of the novel, but they are surrounded by a community of people–good and bad–and better known historical figures whose actions altered the lives of Mr. Garren’s ancestors. Mr. Garren does a good job of portraying the mixture of political allegiances in the western part of this state, the chaos at the end of the war, and the way that actions from those war years could reverberate through the decades. The Secret of War is the fruit of many years of research. Readers who are drawn to historical topics will be delighted by the historical photographs that Mr. Garren has included and by the index of names, places, events, and military units at the end of the book. Interested in the Civil War? Click here to read today’s entry for Wilson Library’s The Civil War Day by Day blog. Tracy Crudup. 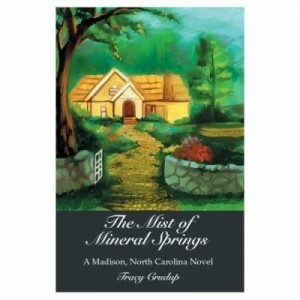 The Mist of Mineral Springs. New York: iUniverse, 2004. Kennedy (Ken) Clarke isn’t someone to rush into marriage, but she’s no stranger to romance. She’s a writer and when this book opens, she has just sold her first romance novel to a major New York publishing house. She’s also about to marry the man who has won her heart, Garrett Langston. It seems a match made in heaven, and their families and most of the small town of Madison, North Carolina will turn out for the wedding. But two days before the wedding, Garrett is killed in a car accident. Kennedy, devastated, retreats to the beautiful cottage that Garrett built for them. There she feels Garrett’s presence, hears his voice. As time goes on, family and friends worry about Ken and the connection that she still feels to Garrett. But that feeling comforts Ken and buoys her in the lonely hours while she writes. Garrett become a kind of guardian angel who will stay with her until she is ready to begin again with someone new. 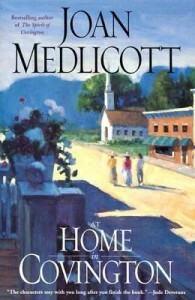 Joan Medlicott. At Home in Covington. New York: Atria Books, 2004. A year after the fire that destroyed their 19th-century farmhouse, the Ladies of Covington have rebuilt and moved on. But wood, plumbing, and tiles aren’t the only things that have changed in their lives: Hannah, Amelia, and Grace each face difficult decisions and shifts in their relationships with those they care about most. Hannah’s daughter Laura is heavily pregnant and worried about how this first child will change her career-focused life. Hannah herself receives a piece of mail that causes her to relive her unhappy past; because of it she grows increasingly anxious about her agreement to marry Max. Grace’s son Roger loses his longtime partner Charles to HIV-AIDS and decides to move closer to his mother–a decision that Grace isn’t completely happy with. Amelia isn’t either, since Roger rejected the love of her close friend Mike, who has yet to recover. Grace becomes jealous of her boyfriend Bob’s friendship with the ribald Ellie, and Amelia begins to wonder if she can live with this new, brooding Hannah. All three of the Ladies worry about teenage Lucy, who gets in trouble at school and may be talking with an unsavory person in an online chatroom. With so many stressful changes happening, the Ladies decide they need a vacation and promptly book a Caribbean cruise. Everyone tries to relax, but it’s difficult living in such close quarters. Amelia and Hannah begin to fight, and Grace feels caught in the middle. Even though the the fire is long over, could the Ladies go up in smoke? As usual, Covington works its magic, and all turns out well with good food and good friends. Mark Schweizer. The Baritone Wore Chiffon. Hopkinsville, KY: St. James Music Press, 2004. This second novel in the Liturgical Mysteries series has Hayden Konig hopping back and forth between his little mountain town of St. Germaine and the northern English city of York. Hayden is called to England to assist the local police when a baritone from North Carolina, Kris Toth, is found murdered in the treasury vault of York Minster, the beautiful Gothic cathedral. The local authorities are surprised to discover that Toth was a woman, not a man, and they fail to notice that one of the jewels in the treasury is missing. Hayden is the one who notices that, and in short order he deduces that Toth and an accomplice planned to steal the diamond. But the theft is one thing and Toth’s murder is something else. In a surprising, but believable plot, the reader learns that the murder has its roots in a family’s history, and that the new interim rector at St. Barnabas is part of that history. Carl Kenney. Preacha’ Man. Victoria, BC: Trafford Publishing, 2004. Simon Edwards moved to Durham, North Carolina to teach, not preach, but he allowed himself to be pulled back into parish ministry. Shady Grove Baptist Church prospered under his care. The size of the congregation grew, its finances stabilized, and the church brought inner healing to its members and concerned engagement to the community. But not everyone liked that. Deacon Andrews, whose family founded the church, is used to having every pastor under his thumb. The deacon spreads rumors about the pastor and stokes the flame of discontent among those who like the old ways. Church politics can wear a man down. Strong family support and a clear mind can save him, but Simon has neither of these. His wife, Janet, suspects him of infidelity even while her actions threaten the marriage. Simon himself is full of pain from abuse and missteps earlier in his life. As the novel builds to a conclusion, Simon must decide whether to fight for his pulpit or flee to a new life. Michael Morris. Slow Way Home. New York: HarperOne, 2004. Brandon’s life has always been full of uncertainty. Whether he is trying to navigate his mother’s erratic, alcohol-fueled moods or to protect himself from her abusive boyfriends, Brandon is always on the edge. That all changes when, at the insistence of his mother’s latest mate, Brandon is sent to live with his grandparents near Raleigh. Although he feels abandoned at first, Brandon deeply appreciates his new stable home life and his grandparents’ undying love. Uncertainty follows him to the Triangle, however, when his mother returns demanding Brandon. His grandparents are unwilling to place him back in her unpredictable care, and they initiate a custody battle. Although Brandon’s mother arrives late and disheveled to visitations and legal meetings, the judge rules that Brandon should be returned to her. Brandon’s grandparents cannot bear the thought of parting with him, and seeing no other options, they decide to abscond with Brandon to Florida. They change their names, their appearances, and their stories and start life anew. Brandon has a chance to start over in Florida, but he brings one aspect of his previous life with him: fear. He and his grandparents bristle at the sight of police officers, and Brandon panics on a field trip when he mistakes a stranger for his mother. Although they find a happy life in Florida, Brandon’s fears are realized when their secret is uncovered. He is sent back to Raleigh to live with his mother, and his grandparents are sent to prison. Although Brandon can anticipate that his mother will prove to be an unfit mother, he has no intuition about who will save him. One individual’s benevolence allows Brandon to let go of his fears and to be reunited with his grandparents. Feeling free at last, Brandon maps out his destiny. Cynn Chadwick. Girls with Hammers. New York: Harrington Park Press, 2004. Lily Cameron has always done things her way. While she followed her father’s footsteps in her career choice of contracting, she did not join the family business. Instead, Lily founded her own all-female construction company, Girls with Hammers, with her best friend, Cat. The youngest child – and only girl – of seven siblings, Lily is still a tomboy. She drinks, smokes, punches, and curses, although she still has a soft spot. And Lily is in a devoted relationship with Hannah in (fictional) Galway, North Carolina, a small town where homosexuality is discussed in hushed tones. Lily’s life takes a sudden turn with three events: Cat’s decision to take a teaching position in Scotland, Hannah’s distance – both emotional and physical – as she accepts a fellowship in the Netherlands for a few months, and the unexpected death of Lily’s father. Although Lily would crawl underneath a rock to avoid addressing these changes, she is pushed to action with the reading of her father’s will. Of all of his children, she was the only one who showed interest in the business, so he left Cameron Construction Company to her. Lily is faced with many challenges in her new role, including the unwillingness of men to work for a woman. Banding together a motley crew of musicians-turned-construction workers, Lily tries to keep the company together. Unfortunately, a spree of vandalism and arson cause the collapse of the company. Lily was happier and less stressed with her small company, so when the opportunity arises to sell the family business, she takes it. When Hannah returns after six months overseas, Lily is not sure what the state of their relationship will be. However, the time apart brings them closer together, and they begin to consider starting a family. With Hannah back, Girls with Hammers back in business, and plans for an exciting future ahead, Lily finds relief in a return to doing things her way. Lynette Hall Hampton. Jilted by Death. Johnson City, TN: Silver Dagger Mysteries, 2004. Willa Hinshaw is the new associate pastor at First United Methodist Church in Liverpool, North Carolina. She’s expecting that her job will involve sermons, Bible study sessions, and counseling. She’s not expecting kidnapping and murders, but that’s just what she encounters in this, the first novel in the Reverend Willa Hinshaw Mysteries series. Lee Ann Poole, a lovely young woman from one of the town’s best families, is someone who Willa has meet only briefly after a church service. Despite that, Willa is called in by her boss, the Reverend Philip Gallaway, to deal with the crisis when Lee Ann elopes on her wedding day, leaving her parents and her fiance bewildered. Willa handles the immediate crisis beautifully–sending the flowers to a nursing home, the fancy food to a soup kitchen, and turning away the wedding guests in a dignified manner. At home that night, Willa is exhausted and more than a little shocked when Lee Ann calls in a panic, saying she is in danger and begging Willa to come to Statesville to get her. Soon Willa is deep into the mystery of Lee Ann’s disappearance–consoling her mother, gently questioning the young man’s family, working with the retired policeman who is investigating the case. Eventually Willa herself is in danger as the kidnapper spins a web of deceit and murder. Tim Myers. Booked for Murder. New York: Berkley Prime Crime, 2004. When Clifton (“Cliff”) Clifford, the security guard protecting the Carolina Rhapsody Emerald on display at the Hatteras West Inn, is found stabbed with a lighthouse letter-opener, his death, though tragic, is easy to explain. Certainly a thief had been interested in the gem, and Cliff was in his or her way. The fake emerald left in the stone’s place is proof. However, for Alex Winston, Cliff’s murder is troubling because it occurred at his inn. A suspicious homicide is not exactly something that he wants to include in his brochures, so Alex feels compelled to help solve the case and possibly find the missing gem. When a guest out jogging is shot in the leg and an unseen gunman fires shots at Alex and Elise, the housekeeper, his desire to get to the bottom is more urgent. Adding to the tense atmosphere at Hatteras West is the finding of Patrick Thornton, a surveyor, that the inn’s lighthouse, its main attraction, is not on Winston land. Can this be true? As Alex learns more about the Thornton and the strange new muffin lady in town, he realizes that an odd connection could solve the mystery. Booked for Murder is Tim Myer’s fifth novel in the “Lighthouse Inn Mystery” series. Robert C. Weber. Block Castle: An Outer Banks Mystery. Baltimore, MD: PublishAmerica, 2004. Tom Dixon’s memories of his childhood are painful ones–no mother, a drunken, angry father, a fire that destroys the only home he’d known, and then years in an orphanage. All this unhappiness and poverty stands in contrast to the natural beauty of the Outer Banks and the imposing Block Castle that loomed over the shore a short distance from Dixon’s miserable house. After being released from prison in Tennessee, Dixon on impulse returns to the Outer Banks. He learns that the locals think that he started the fire that killed his father. Dixon can’t accept that, but when he starts to dig into his past, he’s told by one and all that “there are some things in life that are best left alone.” As Dixon pieces together memories of his childhood with research in old newspapers and courthouse records, and bits of information from the few old timers who will speak to him, he uncovers his true heritage and secrets that a powerful family wanted to keep hidden. Filed under 2000-2009, 2004, Coast, Mystery, Weber, Robert C.